It’s just talk and will remain as such until he gets his license back, but former and unbeaten heavyweight ruler Tyson Fury is busy calling out not only his rival Brit Anthony Joshua, but also Deontay Wilder. 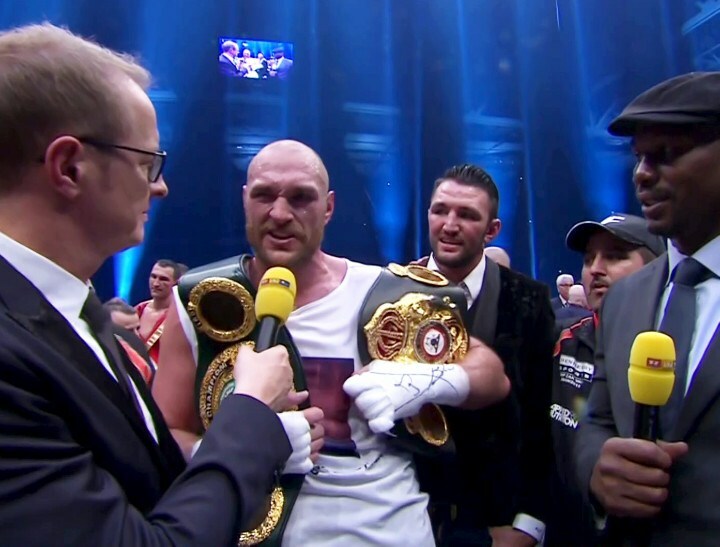 As convinced as ever that he has the beating of both the reigning WBA/IBF champ along with the current WBC king, Fury has declared, once again, how he will be back. And this time, via his twitter page, Fury has said his return to glory by “taking down” Joshua will be just like the great Muhammad Ali’s return to the crown against George Foreman back in 1974. But while Ali genuinely “shook up the world” with his stoppage win over destroyer Foreman, making a mockery of the 3/1 or 6/1 (depending on where you looked for odds on the fight at the time) odds against him with his victory, a Fury win over Joshua would not be seen as anything like as a big a shock. In fact, many fans feel Fury, if he can get himself back into top shape (and this could be the biggest obstacle to Fury winning) outboxes Joshua to a comprehensive decision win. Ali on the other hand had his millions of fans worrying for his very life; some of them anyway. It would be a big fight, possibly the biggest heavyweight title fight today, but Fury-Joshua would be no Ali-Foreman. But Fury doesn’t stop there: he even tweeted the President of the United States no less, asking him if he wants to “be a part of the biggest fight ever.” Fury has invited Donald Trump to accompany him during his ring walk! You’ve got to hand it to Fury, he sure can think big.